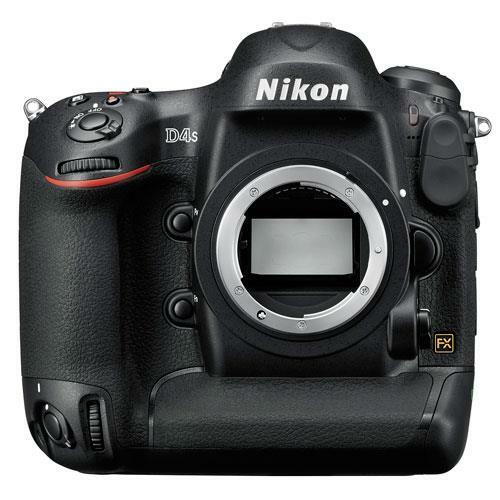 The Nikon D4S is the successor to Nikon's flagship DSLR, the Nikon D4. The main improvements on the D4 include the Expeed 4 processor, wider ISO range up to 409,600, group area AF feature and 11 fps shooting in FX format. The tough, weather-sealed full metal body is retained however a new RAW Size S option for extended continuous raw shooting and accelerated image transfer is added. The D4S’s revamped sensor offers the ultimate image quality. Boasts fast channel readout, wide dynamic range, and clean performance at high sensitivities. Shoot crisper, cleaner, better-defined images at high ISOs. An expanded ISO range of 100–25600 is extendable up to an industry-leading 409600 (equivalent). The D4S offers improved acquisition and tracking performance. Fires at a blazing 11 fps in FX format with AE/AF superior to its predecessor - the D4. Record Full HD (1080p) movies at 50p/60p. Access the ISO range from ISO 200 up while filming and control shutter speed, aperture, and audio levels, too. Nikon’s class-leading AF system has advanced to offer improved acquisition and phenomenally precise tracking of fast-moving subjects over long distances with the new Group Area AF mode. Protected by a tough, weather-sealed full metal body, the reliable and durable D4S sustains peak performance in the most demanding environmental conditions. The D4S has been refined to make handling even better than the D4. Changes include improved button layout and re-shaped control buttons to improve operation in damp conditions, as well as re-contoured thumb and middle finger rests and a smoother grip. The D4S implements Gigabit 100/1000TX Ethernet port and offers a new RAW Size S option for extended continuous raw shooting and accelerated image transfer, plus compatibility with Nikon’s fast WT5 Wireless Transmitter (not included). The D4S takes the class-leading accuracy of the D4 and advances it further. The system is configurable in 9-point, 21-point, and 51-point coverage settings and sensitive down to -2 EV (ISO 100, 20 °C/68 °F). Advancements include improved lock-on, expanded ‘store by orientation’, and options for AF mode restrictions. Track fast-moving subjects over long distances with phenomenal precision. Group Area AF mode constantly monitors five different AF fields, offering improved acquisition and background isolation when shooting subjects that are comparatively small and close to a high-contrast or distracting background. The five-point AF area can be shifted across the 51-point array as composition demands. Push the colour balance and brightness in any direction to suit your personal workflow preference. The anti-reflective 3.2-inch, 921k-dot LCD monitor also offers auto brightness control. For moviemaking in diverse conditions, D-Movie offers broadcast-quality video in multiple frame formats. The D4S records Full HD (1080p) movies in FX and DX formats at 50p/60p frame rates. It offers three sensor crop formats: FX, DX, and native crop (approximately 2.7x) as well as clean HDMI out. With more options for audio control, the D4S offers improved sound recording. A stereo microphone input and an audio out let you fine tune audio levels in isolation both before and during recording. You can select the sound range (wide/voice), and wind noise can be reduced when recording with the built-in microphone. When milliseconds matter, the D4S’s 42 ms shutter lag can gain you the critical edge. The Kevlar/carbon fiber–composite shutter unit is tested to 400,000 releases and a shutter speed of 1/8000 to 30 s, with flash synchronization at up to 1/250 s.
A new shutter and mirror mechanism delivers a stable viewfinder image during high-speed shooting. Image shake caused by mirror movement is effectively reduced with minimal viewfinder blackout. The colour rendering and tone curve have been refined for enhanced definition and additional depth in stills and movies. Picture Controls streamline in-camera image processing by enabling customisation of image parameters before capture, as well as complete control over sharpening, contrast, brightness, hue, and saturation in various colour modes. Offers stable exposure control through the 91k pixel AE sensor. With selectable full-time face recognition function and smoother exposure alteration for improved results when shooting stills, movies, and time-lapse photography. Determine White Balance even under challenging mixed lighting conditions. Easily acquire manual, preset White Balance data based on the selected area within the frame: the size of the area acquired can be retained even when the image is enlarged, and consecutive data acquisition is possible.